In the 1986 blockbuster movie Top Gun, Navy pilot Pete “Maverick” Mitchell was unable to get his head right when he lost his back seater, Goose. He had to get focused on the future and make peace with the past. The question when his squadron was in a dog fight, and needed him, would he engage? I fear this is the same feeling regarding citizens, businesses and landowners in the current small area planning of the Rio/US29 region. Maverick’s question of when to engage is pertinent because while some Rio/29 folks feel as though their perspectives were not taken seriously as the Grade Separated Interchange was pushed through approvals, and they are now hesitant to re-engage in a planning process with what they considered negative results. Yet, like Maverick, we find ourselves at a juncture that requires us to engage. This Thursday, August 9th at 6 pm at the Northside library, Albemarle County planners will hold an open house to get the feedback from the community to their long range plan. The Free Enterprise Forum believes this is the time to engage. A Small Area Plan is a planning tool used to define a detailed plan for urban development and redevelopment in a focused area of strategic importance. 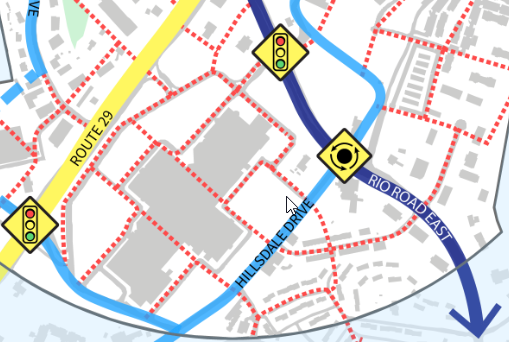 The Rio29 Small Area Plan will devise a vision for the area around Route 29 and Rio Road and create a roadmap for implementation. The vision is guided by stakeholders that live, work, and play in and around the area and by the strategic goals adopted by the Board of Supervisors through the Comprehensive Plan, Places29 Master Plan, and Strategic Plan. In presenting the small area planning process, there will likely be caveats that this process is “visioning” and nothing is written in stone, or even funded. The definition calls for the vision to be guided by the stakeholders however, if the public fails to engage, silence may be determined to be consent. The problem with long term planning is it is about the future and the future is never as we envision. 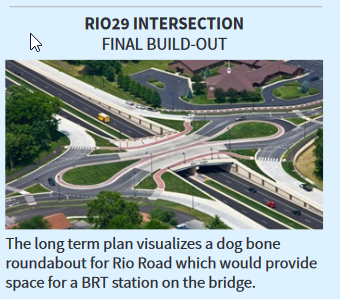 Just twenty four months after the completions of the Rio/US29 Grade Separated Interchange, planners are already scoping out its replacement, the dog bone roundabout with Bus Rapid Transit (BRT) Station. So we are planning for a BRT while we have not yet determined that we want/need this infrastructure investment. Bus Rapid Transit (BRT) is a high-quality bus-based transit system that delivers fast, comfortable, and cost-effective services at metro-level capacities. It does this through the provision of dedicated lanes, with busways and iconic stations typically aligned to the center of the road, off-board fare collection, and fast and frequent operations. The Free Enterprise Forum believes BRT is dramatically better than light rail, but we are not yet convinced that a mere two years after widening North US29, the community is willing to give up a lane on US29 for bus only access. Since the jury is clearly still out regarding BRT, should we be planning this critical infrastructure piece with the station as the center? In addition, the long term connectivity plan calls for roads to cut through Fashion Square Mall to connect to a new access road paralleling US29 and a pedestrian/bike bridge over US29 and that’s just the Southeast corner of the plan. The long term vision will require significant amounts of private property to be acquired, perhaps via eminent domain. Interestingly, the plan calls for roads to run through commercial development but deftly avoids any residential areas (where voters live). The Rio29 Design Concepts – Final Draft Open House also includes a number of Transformative Projects. Broken down into three categories (Short, Mid and Long term) we have not yet seen any cost projections for the projects but we fully anticipate they will be costly. Each topic will have its own station where attendees can provide feedback on the designs. Feedback will be shared with the Board of Supervisors and Planning Commission as they consider incorporating these final draft designs into the County’s Comprehensive Plan. 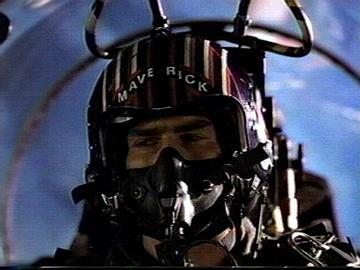 Much like the climatic dogfight in Top Gun, The Free Enterprise Forum is pleading with the citizens, businesses and property owners to re-engage in the small are planning process. Absent all voices, the plan that moves f orward may not be the “community vision” for the future. On August 9th, despite the fact that many will be focused on the upcoming anniversary, I hope the ENTIRE Rio/29 Community will re-engage, only then as a community can we move the shared vision forward.